Who says cocktails are just for drinking? 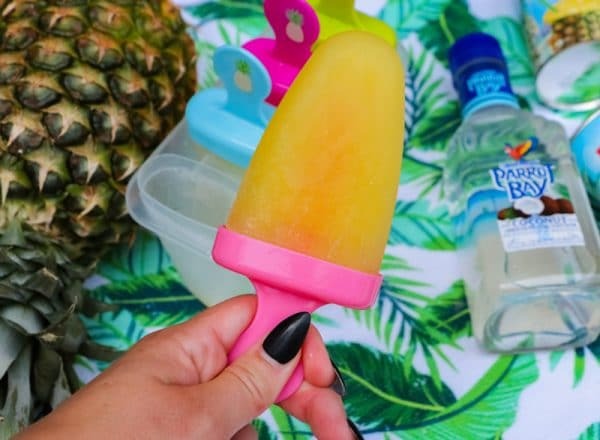 These boozy Pineapple-Rum Pops are the perfect way to cool off this summer, and you won’t believe how easy they are to make. 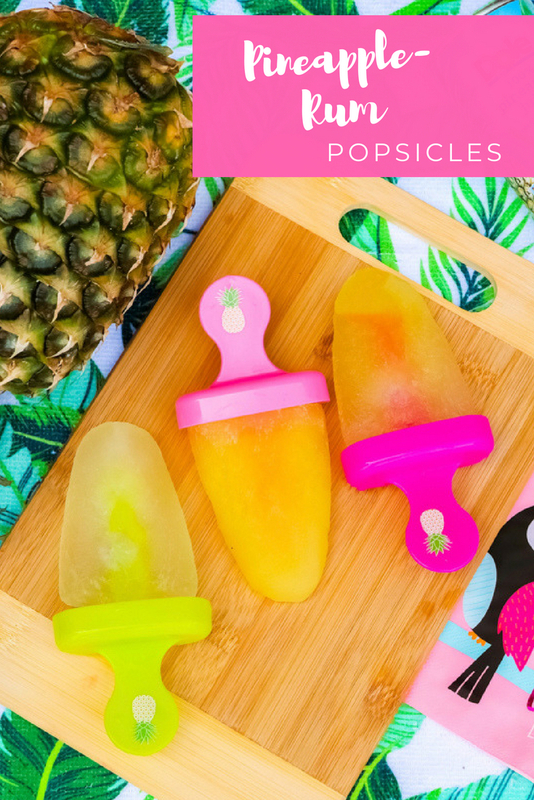 You just need two ingredients and a popsicle mold! Summer is in full swim down here in Florida – and you know what that means. It’s time for hanging by the pool, grilling, and cooling off with frozen treats. I recently posted about my favorite summer pool party menu and my favorite summer cocktail. But something was missing – the frozen treats! And what could be better than a popsicle infused with rum? I sure can’t think of anything. Let’s make Pineapple Rum Pops! These Pineapple Rum Popsicles couldn’t get any easier to make. There are only two ingredients – pineapple juice and rum. 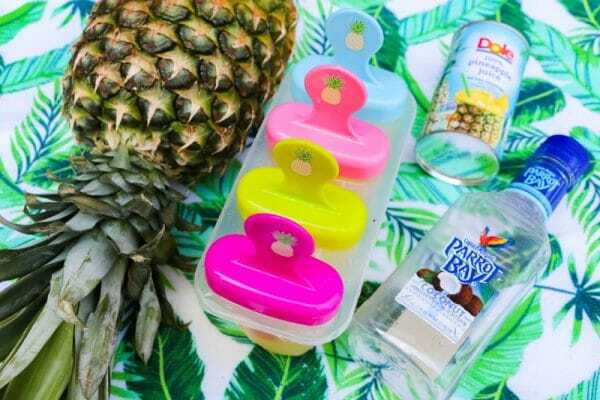 You will need to start off with a popsicle mold. If you are a regular popsicle maker, it’s nice to invest in something like the Zoku popsicle maker, which makes the process so much faster and easier. But if popsicles are an occasional treat at your house, these regular old-fashioned popsicle molds will work just fine. Next, simply fill each of the popsicle molds about 1/4 of the way with rum. You can use any type of rum you like for these Pineapple Rum Pops. I used Parrot Bay, because I like the bit of coconut flavor that it adds. But you could use an unflavored rum as well. A dark rum would even be interesting to try – I think it would add a really robust flavor. 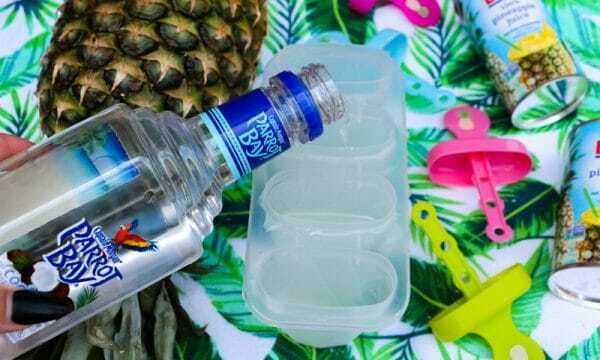 Next, just top off the popsicle molds with pineapple juice. Leave just a little extra space so the molds don’t overflow when you insert the popsicle sticks. Finally, add your popsicle sticks and freeze. Your Pineapple Rum popsicles should be completely frozen in about three hours. 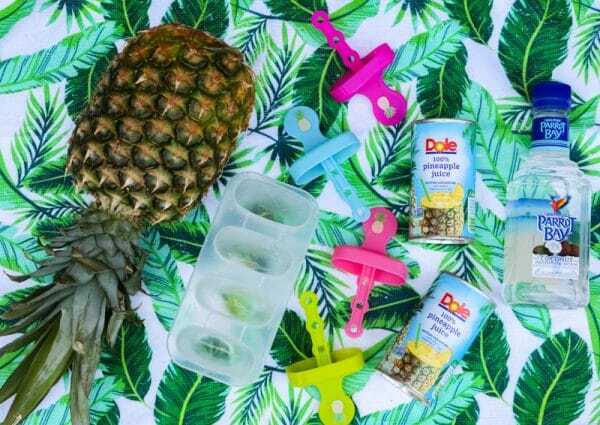 When the popsicles are completely frozen, gently pull the handles to remove each Pineapple Rum Pop. Enjoy! If you’re looking for more frozen treats, be sure to check out my no-churn vienetta and vegan strawberry ice cream. Happy summer! Who said cocktails were only for drinking? 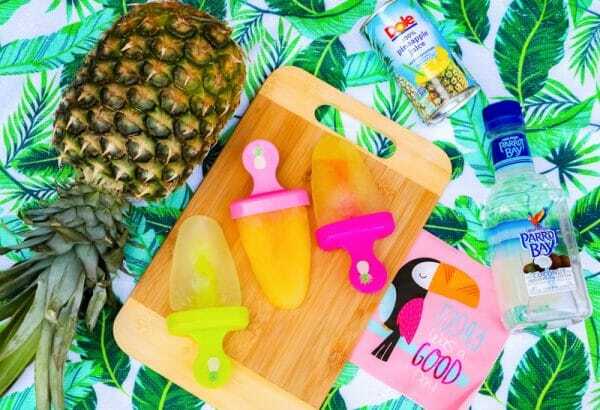 Cool off with these easy-to-make popsicles, bursting with flavor from pineapple juice and coconut rum. Prep popsicle molds for use. 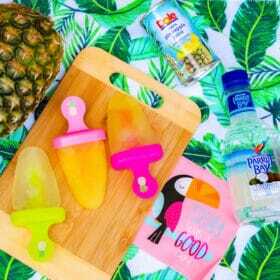 Fill each popsicle mold 1/4 full with rum. 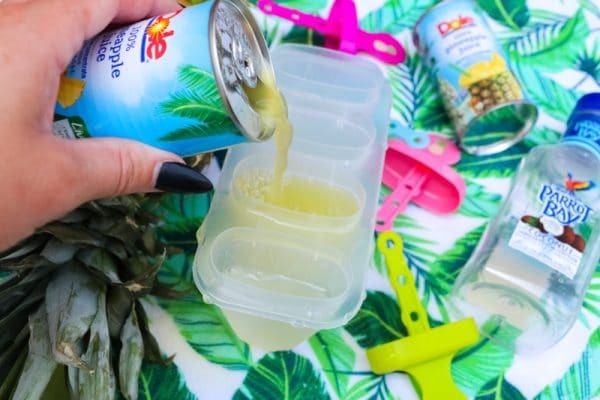 Top off each popsicle mold with pineapple juice until full. Leave a small bit of space to prevent overflow. Freeze for three hours, or until frozen through.